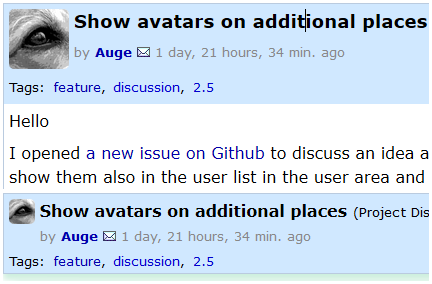 Small avatar Images on the user area page and a small avatar Image of the user near the username top right would be very good. I made a mockup for the list of registered users. The avatar should be displayed in different sizes on different places. As an further example a screenshot of this thread in nested view in the responsive-1-theme with open (top) and folded (bottom) opening posting. The profile should show the avatar in it's original resolution, which is in this installation maximal 128x128 pixels.